Rich German lives in my home-town, Laguna Beach, and loves the ocean’s creatures. He garnered international attention from his video of a close encounter with a pod of orcas. (Board and Rich shown right.) He garnered the attention of some of the leading conservationist organizations in the world including Save The Whales. This led him to start Project O whose mission is to help restore, protect and sustain the ocean, the life living in it and all of humankind, now and for generations to follow. The initial vision is to see the entire coastline of California protected. I grew up swimming daily in these waters. I had two encounters with whales, including a female with her baby and I had NO idea how close she was until I saw my mom and others jumping up and down on the beach. They were about 25 feet from me and my boyfriend, rubbing barnacles off their backs, I think. I was in awe, and a bit scared, but not. let us use some of his images to use to create art as a group. The first image I chose (top) is not typical of Rich. 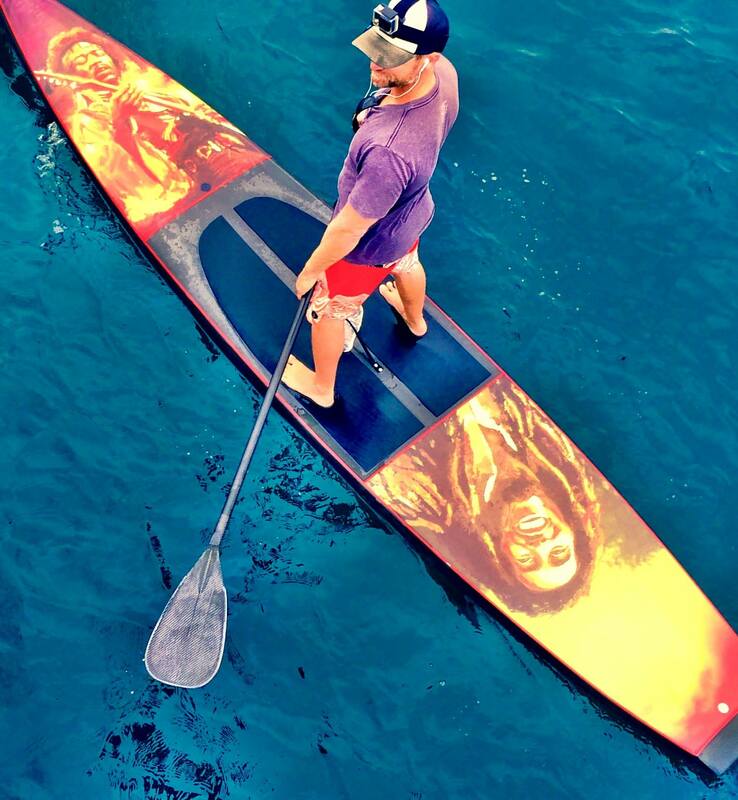 Most he takes with a camera from his paddle-board. 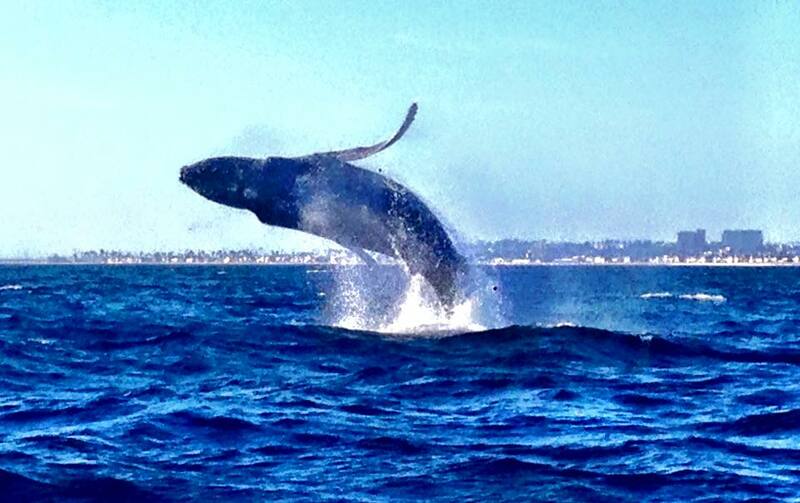 This one was taken off a friend’s boat with his iPhone, if I remember. 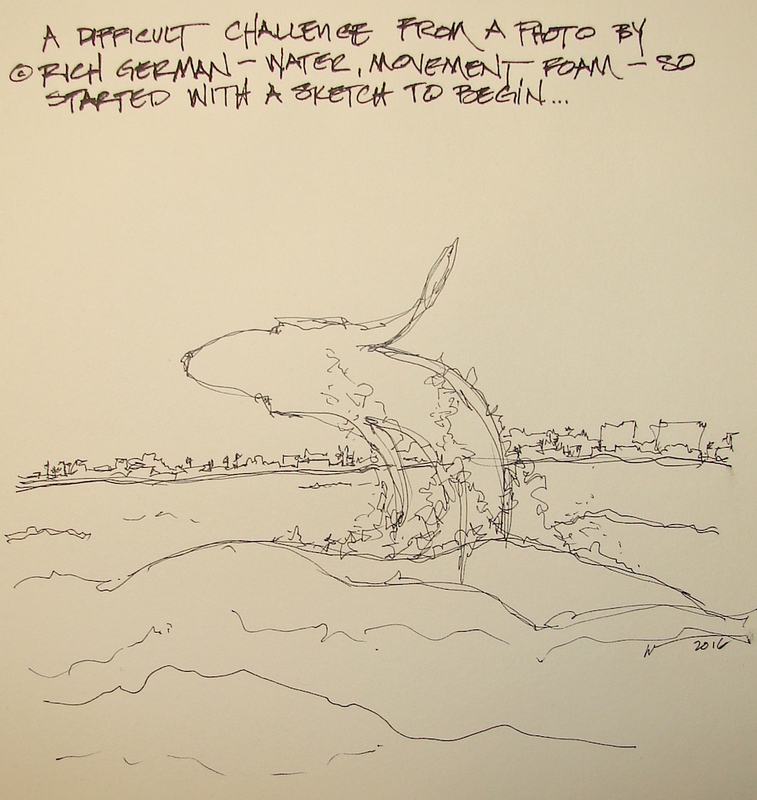 This is a difficult image for me to sketch and paint, full of movement and a LOT of water! Definitely out of my comfort zone, which is the point — to stretch! am trying to get the hang of all that can be done with watercolors. waves and splashes. Primatek Lapis helped deliver the moody skies and water. I can’t thank Rich enough for allowing us to use some of his images. You can, by visiting his page and joining his cause. with a portion of the proceeds benefiting the ocean. Platinum Carbon pen, and Daniel Smith, Holbein, and QoR watercolors. ©D. Katie Powell, except for photographs ©Rich German. 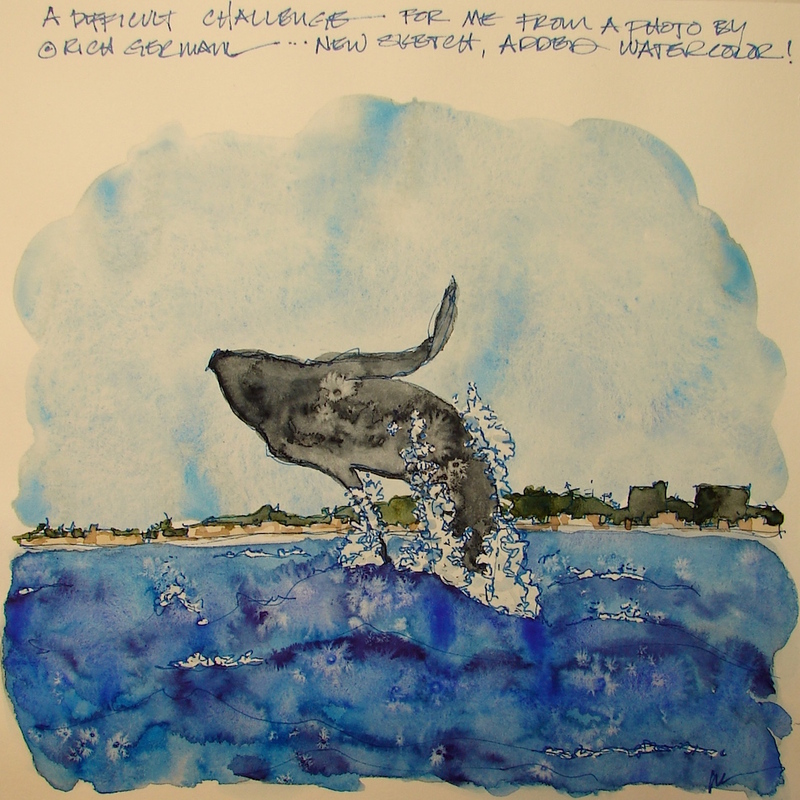 This entry was posted in animals, art journal, challenge, drawing, painting, pen & ink, sketchbook, virtual sketching, watercolor and tagged Aquabee Super Deluxe Journal, art journal, Daniel Smith Masking Fluid, Daniel Smith watercolors, Hol, humpback whale, Laguna Beach, Pentalic HB woodless pencil, Platinum Carbon pen, QoR watercolors, Rich German, watercolor, whale watching, whales. Bookmark the permalink. Terrific cause and wonderful rendering of the photo! Hooray for working to protect these giant beasts!